Search Engine Optimization (SEO) is not the exclusive property of big businesses, the Home Depots and Lowes, or the Walmarts and Targets of the world. There is also room for local interior decorators and small specialty shops. In fact, it is probably true that most business, professional services and non-profit websites are aimed at a local audience. All of these websites should be employing local SEO services aimed at driving their local branding strategy, but many fail to do so. 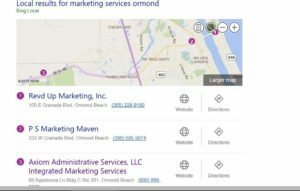 You can see that Axiom Administrative Services appears on the map even though the first contact with clients is likely to be by telephone or email. Axiom’s presence on the map is still a reminder that it operates in the Ormond-Volusia-Flagler area. If you want to optimize for a service area in which you are not physically located, quality content must be your main tool. You should write a lot about that area, and do not try to fake it or to use cut and pasted material from other sites. Search engines are becoming more and more accurate in detecting this, and it will lower your ranking. A critical step in a good local SEO strategy is to claim your business listing in all of the major portals that browsers use to find products or services. 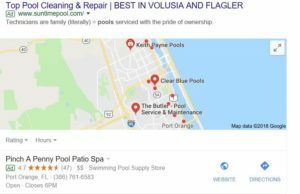 These include Google My Business, Facebook for Business, Yelp, Bing Places for Business, the Yellow Pages (YP) and any of the others that are commonly used in your geographic area or in specialized markets. Each of these listings should include your business name, address, phone number a link to your website, a description of your business (approximately 250 characters), business or service category, your logo and at least one graphic or photograph. All of this is sound advice, and much, much more is at numerous sites on the web. The “catch” is that doing this is beyond the time and interest boundaries of most business or professional people. Even with good instruction, building a good local SEO strategy requires time, effort and resources that most business people simply do not have. If you are struggling to find digital marketing solutions that work and branding strategies that make your business stand out, turn to Axiom. Your business deserves more than a cheap web design, and Axiom is more than an internet marketing agency. Axiom Administrative Services has the professional skill and small business SEO skills needed to get your web presence the ranking it deserves.